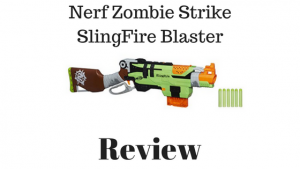 The Nerf Zombie Strike Series is meant to survive and eliminate The Zombie infestation. 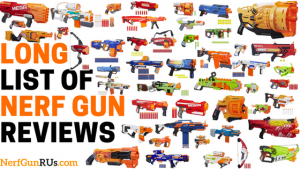 Some of these Nerf Guns are designed to help you survive, others are meant to kill everything in sight. 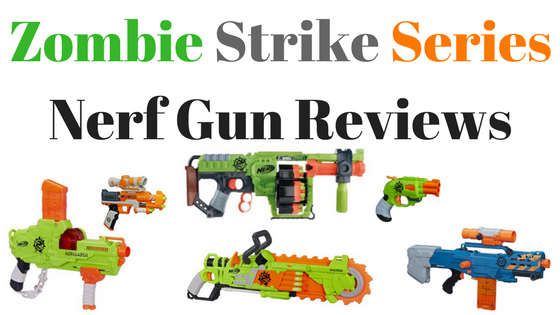 Read The Zombie Strike Series Nerf Gun Reviews to find out which will work best for you! 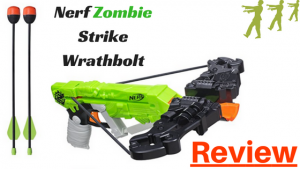 The Nerf Zombie Strike Wrathbolt is the smaller version of The Nerf Zombie Strike Dreadbolt, Still only firing 1 Nerf Arrow, but without any tactical rails or ammo holders. When you need to stick a Zombie in the head, lets say The Wrathbolt will do the trick! 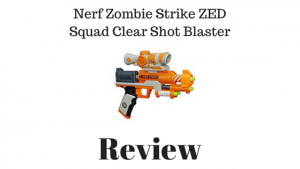 Specifically made as the secondary Nerf Gun for the Zombie Strike Force to eliminate the Zombie Problem, The Nerf Zombie Strike ZED Squad Clear Shot Blaster fires one Nerf Dart at a time, with the scope attachment, you should have no issue, hitting a Zombie with a headshot! 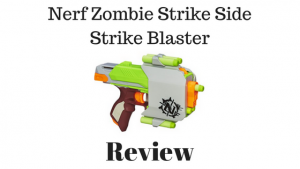 The Nerf Zombie Strike Side Strike Blaster is one Nerf Gun that you can secure on your hip as you run around, making this a great secondary Nerf Gun, for Zombies or eliminating others. You may only get one shot, but like always, one shot may be all you need! 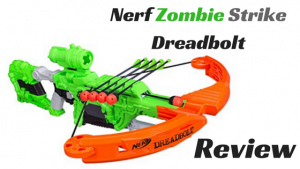 When you are tired of firing traditional Nerf Darts at your Zombies, maybe you are just tired of how they drop each time, the same way, every time… Well now you have the option to not just destroy Zombies with Nerf Darts but scramble their brains with Nerf Arrows! Stick arrows in your Zombie Targets but always end it with a head shot! When you are tired of just simply head shot, head shot, head shot, on Zombies and watching them go down each time… You need something that will help you toy with your Zombies before you destroy them with a head shot! 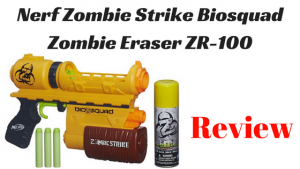 The Nerf Zombie Strike Eraser ZR-100 gives you a whole can of Zombie Repellent that gives you the options to disorient your Zombies however you want… Take away their eye sight! 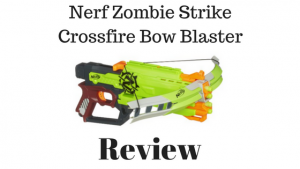 If you want to look awesome while killing off a group of Zombies, then you are going to want to check out The Nerf Zombie Strike Crossfire Bow Blaster. This holds 4 Nerf Darts that you can fire with the draw back of the stings and pull of the trigger, always aim for the head on a Zombie! By far one of my favorite Nerf Pistols. 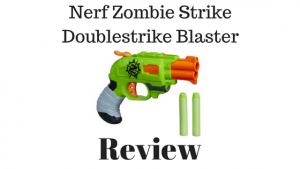 The Nerf Zombie Strike Doublestrike Blaster holds 2 Nerf Darts that you can fire with one hand because the hammer action is so easy to use. Draw back the hammer and pull the trigger. Headshot on a Zombie or elimination of an enemy, either way works just fine! 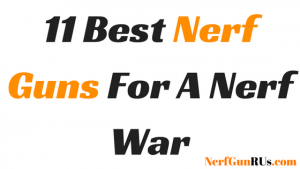 Are you sick and tired of just shooting Zombies with Nerf Darts? 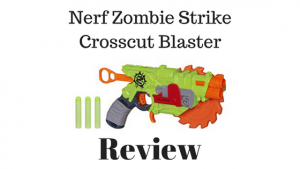 With The Nerf Zombie Strike Crosscut Blaster you get the option to shoot a Zombie or you can run at it with the spinning sawblade! Shoot the Zombie in the leg and finish it off with the sawblade? Whatever you can think of! 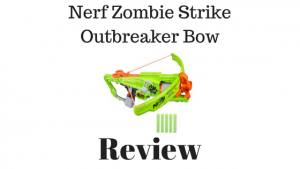 Similar to The Nerf Crossfire Bow, The Nerf Zombie Strike Outbreaker Bow is a crossbow styled Nerf Gun that you draw back the lever attached to the strings and fire, except this Bow has a 5 Nerf Dart holding rotating barrel! 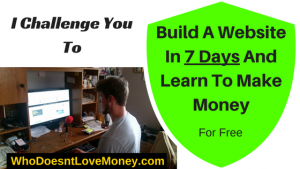 Draw back and fire 5 times with ease! 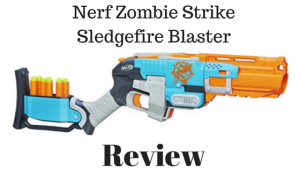 The Nerf Zombie Strike Sledgefire Blaster is perfect for rescuing the innocent from Zombies or just blasting anything in your way. You need to load your shell with 3 Nerf Darts then load it in. 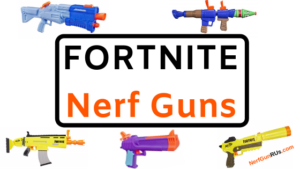 Each shot has 3 Nerf Darts to make sure you hit your target! 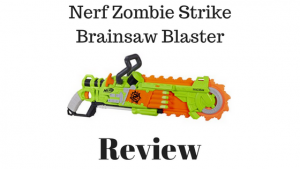 When you want to upgrade from The Nerf Crosscut, you will want to choose The Nerf Zombie Strike Brainsaw Blaster, with this you get 8 Nerf Darts to fire at Zombies. You can use the Nerf Darts as safety lines and go in and saw them up, shoot them when things get too close! 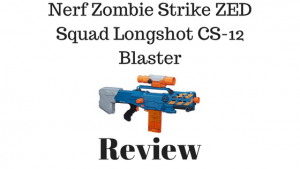 Specifically made to be the primary Nerf Gun for The Nerf Zombie Strike Force, The Nerf Zombie Strike ZED Squad Longshot CS-12 Blaster allows you to find and eliminate a group of Zombies in seconds, when you need to, make sure you have your Nerf ZED Clear Shot ready! 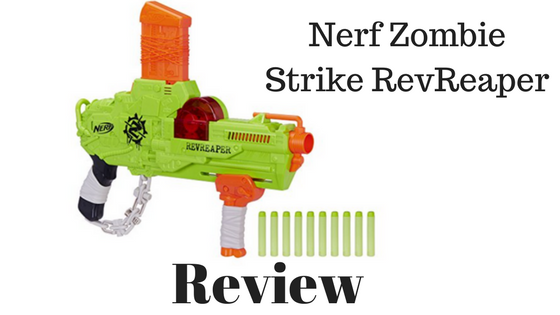 The Nerf Zombie Strike RevReaper allows you to SlamFire without the use of any trigger, in fact you don’t ever get to use a trigger. The RevReaper gives you RevFire that fires one Nerf Dart each time the pump action reaches the back of the stroke. The faster you pump the faster your flywheel spins, the faster you spin the flywheel, the faster you fire your Nerf Darts! 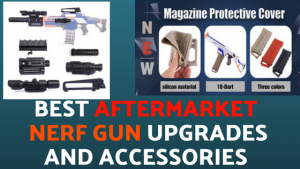 When you are looking to hunker down and defend your land for the Zombie hoards, then you will want to go with The Nerf Zombie Strike SlingFire Blaster. You get 6 Nerf Darts to fire at anything that comes your way, whether it be Survivor or Zombie, make sure you blast them! 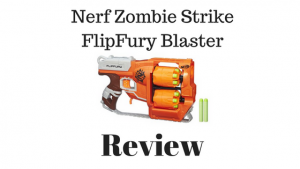 When you want to confuse your target, you will want to use The Nerf Zombie Strike FlipFury Blaster. When you fire your first 6 Nerf Darts, they will think you are out, then you flip to the second set of 6 Nerf Darts to finish them off. Zombies don’t really think too much, make sure you are trying to confuse an attacker! 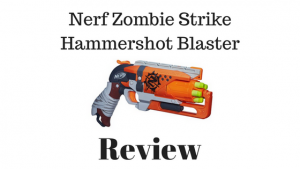 I am a huge fan of The Nerf Zombie Strike Hammershot Blaster for the fact that it is extremely easy to use and its powerful. Take The Doublestrike and upgrade it, and you get The Hammershot! Awesome to take out hoards of Zombies, if you put a Hammershot in each hand, you will be a Zombie eliminating machine! 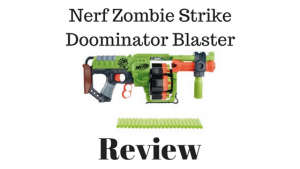 The biggest Nerf Gun out of The Nerf Zombie Strike Series goes to The Nerf Zombie Strike Doominator Blaster. 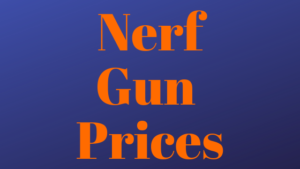 You get 24 Nerf Darts to fire at anything you want! See a hoard of Zombies coming your way? Take them all out, 6 shots at a time and rotate the drum to the next one! When you take a Nerf Gun from the Zombie Strike Series, you better be ready for headshots! No Zombie goes down with body shots, unless maybe you use… The Doominator! Aim for the head, because that is how you kill Zombies! Zombie Nerf Gun Fun For All!